But when did you last make a distinction between necessities and necessaries, or various and several? Half of our pet peeves could seem equally arcane by 2109 — and we don’t know which half. Yup. You need to read the piece. Just to clarify, the column is about Bierce's Write It Right, which Jan has edited and annotated for a new edition to be published this fall. 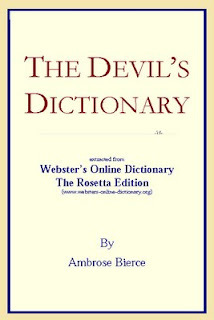 The 1000-word canonical version of the DD is in the U.S. public domain (it was published well before the cutoff date of 1923), and copies in many forms can be found by googling. The various extended editions published since then are in dubious copyright -- the original materials are obviously not, since all of them precede 1923 as well, and mere alphabetization does not count as sufficient originality for U.S. copyright. Write it Right can likewise be found by googling. Well, Ben, for once, it was a typo and not a mistake of substance -- that was supposed to read 'the author of' in there. (I've never actually read Write it Right.) Thanks. Yeah, John, but I really want to find that classic old copy of the DD.